Dungarvan, Co Waterford is the location for a McGrath Clan Gathering next June. It is been run as part of The Gathering 2013 initiative, which will see thousands of Irish people from around the world visit Ireland. 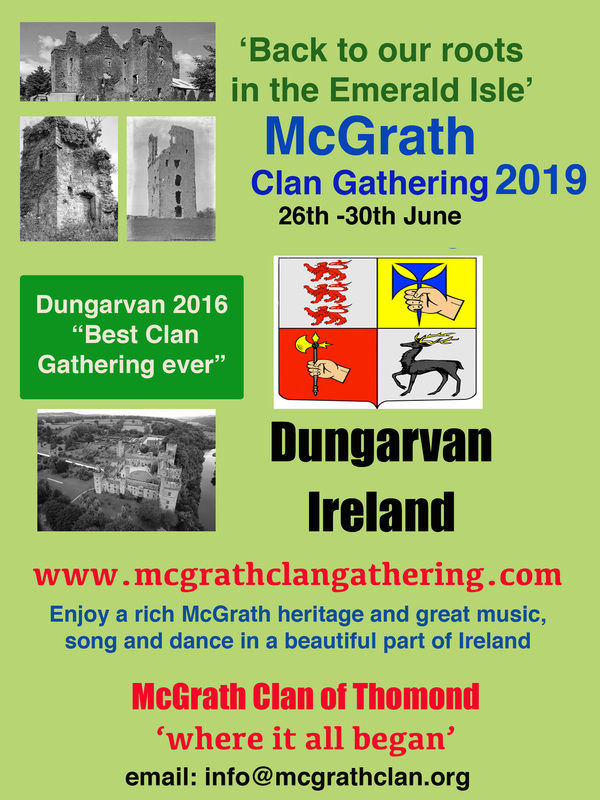 So if you have McGrath in your name, if it is your father or mother’s surname , your grandparents or anyone related to you, why not think about joining us in Dungarvan in 2013. It will be a weekend of heritage, community, song and visits to what is left of the McGrath Castles, in which was one of the McGrath strongholds. The event will be held in the beautiful seaside town of Dungarvan on Ireland’s south coast, which has lots to offer any visitor, from great restaurants, safe beaches, and friendly people. It has also the bonus of been close to an Irish speaking area, which help ensure that good traditional music will be available throughout the weekend. Visitors will have the opportunity to visit the world famous Waterford Crystal centre which is less than 40 minutes from the town. The event will start on the evening of Thursday June 13th and continue till Sunday 16th. Saturday will be the main day with talks, and social evening. Exact time table has to be finalised but it’s planned to give visitors a sample of what’s good about Ireland. There will be lots to do in your spare time, from shopping to playing golf on any of the 3 golf courses within 10 minutes of the town centre. Anyone who plans on coming to the event are more than welcome to contact us regarding any aspect of their visit to Ireland, and we’ll do our best to help and advise. To be included on the mailing list for the event, send an email to info@macmediagroup.co.uk . This entry was posted in Uncategorized on October 11, 2012 by McGrath Clan (official). Please feel free to add your event to http://events.irishabroad.com and share with IrishAbroad.com’s members worldwide.